The Sydney Deep Brown look for in-stock synthetic lace front wigs is an easy-to-wear-and-easy-to-manage stylish wig. It has an easy to manage design so great for those who are new to wigs. Being heat resistance you can add curls and texture. It’s a longer wig so great for those who… well… love long hair! It’s not a heavy wig despite its length; oval faces suit this wig as do round/heart shaped faces. Those with oblong or square type faces may want to choose the 16” version of this wig, or use off centre partings and low heat curling irons to add fullness to the face and softness to jawbones. The wig is made from machine made wefts at the back with quality Swiss lace at the front - can be worn in a ponytail and comes with small fine hairs at the hair line (also known as baby hairs). A medium density for a full but natural look, 20 inches in length. Yes. You can use your tongs and curling irons on this hair as it’s heat resistant to 180 degrees Celsius. The colour of this wig means it’s great for all skin ones. 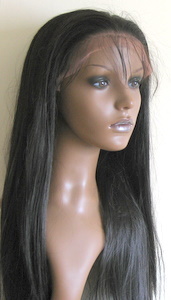 This is a silky straight wig and the cap construction of these synthetic lace wigs means they’re adaptable. It’s a great cap for those who have growth hair as well as those who have lost all or some of their hair. The colour shown is 2 but if you’d prefer it in another colour check the rest of our catalogue of products or visit our custom section for synthetic lace front wigs or contact us and we’ll arrange it for you.